While attending the 2000 Western Idaho Horse Fair in Boise, I met a beautiful woman in her sixties who approached my art display booth. With an air of self-assurance, she introduced herself as Kathryn, and asked what I charged for commissioned portraits. She went on to explain that her daughter, Tracey, was a partner in owning an Andalusian stallion named Navarre. They were exhibiting him at the show. In short order, she made arrangements to commission me to photograph the horse, gave me a down payment, and breezed out of the booth. I had never met anyone as decisive as her. Yet, under her gracious and business-like demeanor, I had seen the twinkle in her eye at the prospect of giving her daughter this gift. I was excited at the chance to paint Navarre. I had noticed him at the show because he had such a dignified bearing. He drew onlookers like a magnet. From his small pipe corral inside the show building, he observed the goings-on with interest. He didn’t get overly saturated like the other horses, which often turned away from viewers after the first day. He was as interested in people as in other horses. He didn’t tire of greeting eager spectators. He gave each person, including me, their due sniff and his brief attention, before he turned away to attend his own thoughts. Tracey and I met to discuss the portrait. She was excited about the portrait and the prospect of using it in her advertising. While we discussed possible ideas, I noticed her booth colors were red and black. I had a momentary vision of the black stallion against a red background. It wasn’t until months later that this vision resurfaced. Days later, I photographed Navarre at his home, Deer Valley Andalusians. This gave me the opportunity to see him in his natural environment. When the handler let him loose into the sand arena, it was easy to see that he was the king of the farm. Just as he had at the horse show, he watched all the activity with great interest. 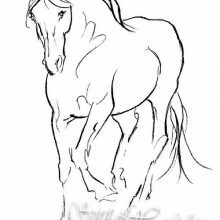 He greeted other horses with a great display of prancing, arching his proud neck, and swinging his long, wavy tail behind him like the bustle on an old fashioned dress. While in the paddock with him, I felt completely at ease, even when he leapt into the air and did a spontaneous capriole! He was clearly performing for me. He paid close attention to my position, and moved around me in graceful turns. As I watching him through the camera lens, I had the impression that I was watching him in slow motion. His size and carriage made each of his movements bold and deliberate. At one point, he stood by the fence and looked over his shoulder at me and then turned away. I said, “Navarre, would you look at me that way again, this time with your ears forward?” He did exactly that! He was beautiful, gentle, and intelligent. I also realized he was probably one of the happiest stallions I had ever met, which accounted for his relaxed movements and beautiful expressions. When I had the film developed, there were so many good pictures it was difficult to choose which one was best for a head portrait. I also had the challenge of deciding which ones to recommend to Tracey. I wasn’t sure which style she preferred. Some of the photos lent themselves to a classical portrait, and some to a more contemporary style. One photo did catch my eye; in it I had caught Navarre tossing his with his mane whipping into the air. I assumed that Tracey would not pick this photo, as it didn’t show his face clearly. But when she called to discuss the photos had sent, she surprised me by saying it was more important to her that I paint which photo I felt best captured Navarre’s personality and essence, rather than trying to focus on a realistic portrait. Her words were something like, “I know what he looks like, I just want to convey to others who he is.” Of course, these words were music to my ears. Then she told me she liked one photo in particular, the one with his mane flying into the air. Tracey left the choice of composition and background colors up to me. Her faith in my artistic instincts gave me the freedom to dream about the best possible creation I could imagine to capture the unique and bold persona that Navarre embodied. One day I was absentmindedly thinking about the Spanish history of the Andalusian breed – and then it hit me, a matador’s cape! Red and black, just like I had envisioned when I first met him. Even with these inspirations intact, it took time for me to get into the right frame of mind to create the portrait. I often think of the moment when I begin a portrait as a time when I must be ready to condense my fragmented energy and focus on one intense task for hours at a time. One of the things I did to motivate myself was to create a few sketches of him in my Spirit Signature style. The sensation of feeling him move again in my drawings reminded me of Navarre’s true presence, and allowed me to transpose those feelings into the photograph and begin the portrait. When I prepared to work on the color pastel, I stilled myself and wondered where to start. As looked at the paper on my drawing board, sketched only with the outline of Navarre’s head, I knew I wanted to create the background to mimic the swirl of a matador’s cape, yet I had not been able to find a photo of a cape, so I had to trust my instincts. I turned on my stereo and selected some Spanish guitar music. I began to draw. The red of my pastel swept into an “S’ shape which echoed the movements of the horse. Once the color was on the paper, I was able to let go of my hesitation. I was carried away with the music and I began to enjoy the flow. I envisioned a matador’s cape; highlight and shadow, curve, and fold. I felt the boldness of the Spanish heritage through the music and infused the chalk with this energy. After awhile, I stood back and observed what had emerged. The background was unlike any I had ever created. 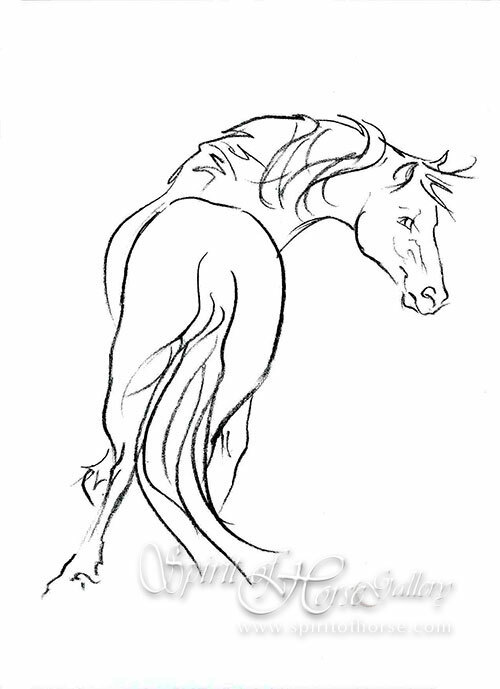 Though I hadn’t even started on the horse, the piece was coming to life. The next day it was time to start working on Navarre, I looked again to the photograph. I thought of the nature of the split second image. It was the my task to go beyond the photograph and think of the motion of the horse, the rhythm of his preceding movements, and his thoughts and attitude. It wasn’t enough to duplicate the photo; I needed to create a vision of what the real horse Navarre was like. I recalled his power and presence and tried to convey those impressions through a two-dimensional image. I looked repeatedly at the tiny photograph and enhanced the highlights and shadows that were barely there. From other references I was able to see details of his face, such as the characteristic cowlick swirls on his cheeks. I worked until I tired, take a break, and then continue. This part of the painting took several days. At last the painting was almost completed. I always save the eyes until last. The cloudy day allowed me to get into an introspective mood. I studied the photo, trying to ascertain his exact expression. This process was more intuitive than literal, for it was difficult for me to even see his eye in the small photo. Just then, a magical thing happened. As I was holding the photo up to my lamp to see it better, the sun emerged from behind the clouds and shone in my studio window to glance across the portrait on my drawing table. The light landed directly on the eye I was drawing. I held the photo up to the light, and it gave me the illumination I needed to see the expression I knew was there. I completed his eye in that pure light. Moments later, my friend Paula arrived. Since she had met Navarre, I was excited to show her the finished painting. I took the painting outside to show it to her. I placed my drawing board on the ground against a chair and we stood back to see the finished piece. The setting sun was dancing in and out of the windblown clouds. The light emerged and played across the painting, making the horse come alive. Then, a cloud appeared, making the background fade and the horse’s colors deepen. When the sun would re-emerged the red would flare up into a brilliant blaze while the highlights on the horse shone. Up and back, bright and dark; it was like watching a movie. We stood transfixed for a long while, knowing that this experience would never repeat itself. I couldn’t wait to show the portrait to Tracey, but I wanted to have it professionally photographed first. I knew a snapshot would never capture the subtle details and bold colors. I was about to mail her the photo of the portrait, when she Emailed me with the news. Her mother, Kathryn had unexpectedly passed away. A few days later, when she was able to talk about it, Tracey shared how saddened she was by her mother’s loss. She was also distressed that her mother hadn’t seen the finished painting. I told her I believed that where her mother was now she would be able see it in its full glory. The painting had become even more profound to Tracey as her mother’s parting gift, though I hoped that it would not be a poignant reminder to her of that difficult time. When I shipped the framed painting, I didn’t hear from her for a couple of days after I knew she had received it. I waited anxiously. Then she called and said she had waited until after her tears had abated to be able to express her deep feelings. She had a difficult time adequately expressing in words what the painting meant to her. I understood. If it hadn’t been for her mother, I wouldn’t have had the opportunity to meet Navarre and experience the creation of another work of art, and Tracey and the countless others who view it would never have been able to enjoy this timeless treasure. Thank you, Kathryn.